The following are results from Crawley and Horsham magistrates’ courts. Matthew Barnett, 47, of Stonery Close, Portslade, was banned from driving for 14 months, with a £110 fine, a £20 victim surcharge, £85 costs, and a £150 criminal courts charge. He had pleaded guilty to drink driving in Langley Green. Jason Morettes, 44, of Tonbridge Road, Maidstone, was fined £350, with a £35 victim surcharge, £85 costs, and six penalty points added to his licence. He had pleaded guilty to speeding in Crawley. Daniel Osborne, 28, of no fixed address, was jailed for a month, with an £80 victim surcharge. 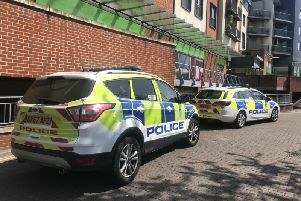 He had been found guilty of being drunk and disorderly, and assaulting a police constable, and pleaded guilty to another count of assaulting a police constable, all in Crawley. Donald Jennings, 37, of Hawkins Road, Crawley, was fined £1,325, with £125 compensation, a £120 victim surcharge, and £620 costs. He had been found guilty of two counts of common assault in Crawley. Giorgio Vagnuni, 56, of Walshes Road, Crowborough, was fined £80, with a £20 victim surcharge, and three penalty points added to his licence. He had pleaded guilty to speeding at East Grinstead. Charlie Warren, 25, of Downland Place, Crawley, was given a two month jail sentence, suspended for six months, with an £80 victim surcharge, and £85 costs. He had pleaded guilty to stealing DVDs from a supermarket in West Green, possessing a bladed article in a public place, and to breaching a conditional discharge. Matthew Percival, 28, of High Street, Oxted, was fined £143, with a £20 victim surcharge, £85 costs, and four penalty points added to his licence. He had pleaded guilty to driving without due care and attention in Crawley. Mihail Bivol, 38, of Wood End Lane, Northolt, was fined £107, with a £20 victim surcharge, £85 costs, and three penalty points added to his licence. He had pleaded guilty to speeding at East Grinstead. Jamel Danquah, 21, of Clyde Place, London, was fined £133, with a £20 victim surcharge, £85 costs, and three penalty points added to his licence. He had pleaded guilty to failing to comply with a no entry sign on a road in Crawley. Daniel Reoch, 31, of Housman Way, Felbridge, was banned from driving for a month, with a £520 fine, a £52 victim surcharge, and £85 costs. He had pleaded guilty to speeding on the A23 at Brighton. Clive Thomson, 42, of Grange Road, Aveley, was banned from driving for six months, with a £60 fine, and a £20 victim surcharge. He had pleaded guilty to using a mobile phone while driving at Crawley. Sandra Crawford, 48, of Clarence Gate, Woodford Green, was given a two year conditional discharge, with a £15 victim surcharge, £85 costs, and a £180 criminal courts charge. She had pleaded guilty to four counts of theft from shops at Gatwick Airport. Stacey Falco, 32, of no fixed address, was given a six month conditional discharge, with a £15 victim surcharge, and a £150 criminal courts charge. She had pleaded guilty to using threatening or abusive words or behaviour to cause harassment, alarm or distress in Crawley. Leanne McGovern, 23, of Dorsten Square, Bewbush, was given a community order with a one month curfew, a £60 victim surcharge, £520 costs, and a £520 criminal courts charge. She had pleaded guilty to causing criminal damage, and been found guilty of common assault. Andrew Nichols, 36, of Wither Dale, Horley, was banned from driving for 16 months, with a £450 fine, a £45 victim surcharge, and £650 costs. He had been found guilty of failing to provide a breath alcohol specimen in Crawley. George Papa-Kyriacou, 27, of Apsely Court, Bewbush, was given a three month jail sentence, suspended for a year, with an £80 victim surcharge, £650 costs, and a £520 criminal courts charge. He had been found guilty of common assault. John Smith, 53, of Wellingtonia Way, Edenbridge, was given a two month jail sentence, suspended for 18 months, with a six month driving ban, £664.70 compensation, and £200 costs. He had been found guilty on three counts of causing criminal damage to windows in Turners Hill. Jacob Letsa, 27, of Greenhill Rise, Corby, was banned from driving for four years, and given a community order with 100 hours of unpaid work, a £60 victim surcharge, £85 costs, and a £150 criminal courts charge. He had pleaded guilty to drink driving, failing to stop for police, driving without a licence, and driving without insurance, all in Crawley. John Morgan, 51, of Ashdown Drive, Crawley, was fined £400, with a £40 victim surcharge, £85 costs, and a £180 criminal courts charge. He had pleaded guilty to possessing a Class A drug (cocaine) in Crawley. Iwona Duleba, 27, of Treeview, Crawley, was given a community order with 100 hours of unpaid work, £200 compensation, £85 costs, and a £150 criminal courts charge. She had pleaded guilty to three counts of common assault, and to assaulting a police constable. Nicolae Flaugiu, 23, of Mill Street, Redhill, was fined £200, with £37 compensation, £85 costs, and a £150 criminal courts charge. He had pleaded guilty to stealing perfume from Debenhams in Crawley. Daniel George, 28, of Patching Close, Crawley, was fined £100, with a £20 victim surcharge, £85 costs, a £150 criminal courts charge, and three penalty points added to his licence. He had pleaded guilty to driving without due care and attention in Crawley. Steven Robinson, 39, of Lower Road, Stoke Mandeville, was banned from driving for 23 months, with a £1,345 fine, a £120 victim surcharge, £85 costs, and a £150 criminal courts charge. He had pleaded guilty to drink driving at East Grinstead. Lara Farrell, 26, of Chatsworth Way, London, was given a one year conditional discharge, with £146 compensation, £400 costs, and a £20 victim surcharge. She had been found guilty of taking part in a demonstration likely to obstruct or interfere with the proper use of an airport, causing criminal damage to a coach, and obstructing a highway, all at Gatwick Airport. Chiara Lauvergnac, 54, of Harrowgate Road, London, was given an 18 month conditional discharge, with a £15 victim surcharge, and £400 costs. She had been found guilty of taking part in a demonstration likely to obstruct or interfere with the proper use of an airport, and obstructing a highway, both at Gatwick Airport.